A police jawan injured in an encounter with Naxals in Chhattisgarh's Sukma district succumbed to injuries on Sunday, taking the death toll of security personnel killed in the operation to three. Two district reserve guard jawans were earlier killed and as many others sustained injuries in the gun-battle in Sukma's Chintagufa area. Four separate encounters between Naxalites and police have been reported in the state since Saturday, in which three security men have been killed and seven injured, including a sub-inspector. Two Naxals were also gunned down in these face-offs. While two encounters took place in Sukma yesterday, as many others occurred in Bijapur, including one on Sunday morning. A composite squad of the Special Task Force, the DRG, the Central Reserve Police Force and its elite unit-CoBRA (Commando Battalion for Resolute Action) was on Saturday out on the operation based on inputs about the location of Maoist hideouts in the interiors of Chintagufa, around 500 km away from Raipur. When the security men were advancing through the forest of Dondamarka, a Maoist den, armed Naxalites opened fire on them, leading to a gun-battle. Five STF personnel sustained bullet injuries, three of them critically, in the face-off. Some personnel of the patrolling team were on their way back to the base when they again came under heavy fire from the ultras near Durma village, around 17 km deep inside forest from Chintagufa. Two DRG jawans were killed and as many others sustained injuries in the gun-battle. "Two DRG jawans were initially killed and as many others injured in the incident. Later, one of the injured succumbed while being retrieved from the forest," Deputy Inspector General of Police (Dantewada range) Sundarraj P said. The team engaged in the fierce gunbattle with Maoists since Saturday reached its camp this morning, he said. "Three DRG jawans have been martyred and another injured in the face-off. The body of a Naxalite was also recovered from the spot along with an SLR weapon," he said. The intermittent exchange of fire lasted for several hours following which the security men cautiously stepped out of the forest, he said, adding that bad weather and rainfall disrupted the evacuation operation. The slain DRG jawans have been identified as constable Kattam Rajkumar, assistant constable Sunam Manish, both natives of Sukma, and assistant constable Rajesh Komra of Kanker district, the DIG said. 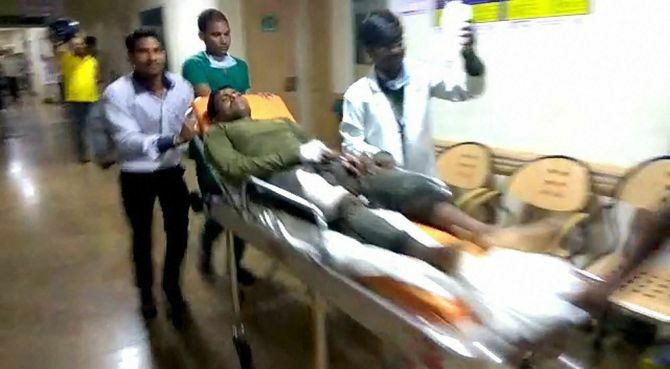 The injured assistant constable has been admitted to a local hospital and efforts are on to airlift him to Raipur for further medication, he said. The DIG claimed that 'nearly 12 Maoists were killed during the operation. However, the body of only one Maoist was recovered along with a SLR weapon from Durma'. He said a major offensive action was undertaken in Chintagufa, considered as the military battalion station of the Maoists. Earlier on Saturday, the same team of security forces had an exchange of fire with ultras in which five STF jawans were injured. They are undergoing treatment here at a private hospital. Besides, a Naxal was on Saturday killed in an exchange of fire with police in Bijapur district. Also, a sub-inspector was today injured in an exchange of fire with Naxals in a forest under Bijapur's Gangaloor police station limits, police said. On April 24 this year, 25 CRPF personnel were killed in a Naxal ambush in Burkapal area under Sukma's Chintagufa police station of limits. Why did 25 CRPF jawans die in Sukma?